‘The Velveteen Rabbit’ is a sweet little tale about a toy bunny who arrives at a nursery one day as the new plaything. At first he is an object of curiosity, but is quickly shunned when the other more expensive toys discover he is made of more inferior material. This greatly saddens the poor rabbit, yet one day one of the toys opens his eyes to a new concept; one where toys can actually become ‘real’. The toy rabbit learns that to become a real bunny, one must be loved by one’s owner; even if that means being loved to the point that a toy starts falling apart. I started reading Margery Williams’ short story after I finished ‘Pinocchio’ by Collodi and whether by chance or coincidence, found it to be similar to that of the wooden boy. Both tales revolve around concepts of imitation versus reality, yet Williams’ tale has a ‘Toy Story‘ like twist, in that it is constructed in a world where toys come to life when you are not looking. This never fails to delight me, which means I have either not grown up… yet. Williams has in her possession an ease of story-telling that looks and reads quite effortlessly but in reality is rather rare. The toy rabbit goes through a few trials and proves himself worthy of becoming a ‘real’ rabbit through his selfless acts as a loyal companion. In the end he discovers that it is not the material you are made of that matters, but rather what’s on the inside that counts. Like in ‘Pinocchio’, the Velveteen Rabbit is eventually granted his wish in becoming a real rabbit through a lovely fairy godmother and all ends happily ever after. This is the first time I read the classic tale of Dorothy, the heartless Tinman, the brainless Scarecrow and the Cowardly Lion in its original form, which to my surprise was both similar to, and different from, the various versions I’ve been exposed. Like all successful children’s stories, this one features an orphan. A child who yearns for home, who is lucky enough (or maybe not) to find someone from her extended family to take her in, but somehow can never be given enough love or attention simply because of her orphan status. One can never take the place of a mother and father. Baum does not say as much, but this is the primary goal of the book; to hammer home the moral to all little ‘wannabe runaways’ that no matter how bad things get, there really is ‘no place like home’. Other motifs crop up symbolised by the Scarecrow, the Tinman and the Lion. These strangers that Dorothy meets along the way all reflect parts of her that are needed to complete the impossible journey ahead. To protect herself, she must use her head. To make good friends, she must use her heart. To face her dangers, she must summon up courage. And of course, she cannot do these things by herself, so she needs companions, teaching her the important lesson to ask for help when needed. The yellow brick road (symbolic of the colour of caution) leads her to various tasks that she must complete in order to proceed homebound. The structure of the lost continent she finds herself in is represented by Baum as a compass, with Dorothy visiting each point (in one way or another) which can be translated as psychological visitations to different parts of her personality. She is tested and tested again, until finally Dorothy comes to the golden realisation that the power to return home lay within her all along. There are parts of this story that came as a surprise, for instance, the ‘fighting trees’ reminded me of the ‘whomping willow’ in Harry Potter, and the Quadlings and the China country were all new, and there were ‘silver shoes’ instead of the famous ‘ruby slippers’. But apart from that I enjoyed the story, and was happy to read something that wasn’t too hard on the brain. But my thoughts remain that this is a book best read during childhood. The reminders and repetition of the different aspects of the ‘quest’ through Oz did frustrate me at times, but is necessary for a younger audience with a shorter attention span. Overall I think it’s excellent for reading with children and retains great potential for conversation with little ones about what is happening in the story. 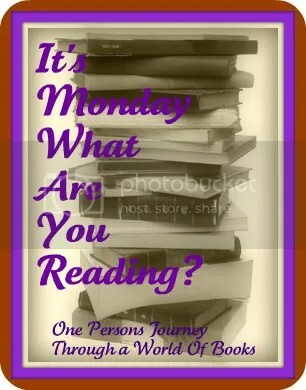 Welcome to ‘It’s Monday, What Are You Reading?’, a weekly meme initially hosted by Sheila at the ‘Book Journey – One Persons Journey Through a World of Books’. This is a great way of letting people know what I’ve been reading over the past week and what I’ve got lined up for this week. The past week has been a VERY busy one for me, and quite exciting. Apart from the fact that I’ve managed to read 3 books (yay! ), I’ve also had the pleasure of receiving my first blog award by Readitin7days and join in the Book Blogger Hop hosted by the fabulous Jen @ Crazy for Books. Finally finished this one. I don’t know why it took me so long, but there you go. Johnny Depp supposedly has the rights to this story (given to him by Hunter himself when he was alive) and is planning to shoot/ has already shot the film version. I wonder if we’ll see Depp as the good Doctor again? This was a quick read. I loved the story and everything about it. Review is here. Did you know this story was 110 years old? Being part of the ‘Rory Gilmore Challenge’ made it a fun read, but I also enjoyed being a little kid again. Anyone who hasn’t read this yet should do so, in fact read it with your kids if you have any. It makes it twice as enjoyable. Lots of moral lessons to be learned! I’ll be writing a review for this one soon. Again, this one got pushed to the back of the pile! I’m notorious for switching my reading preferences, but I promise I will read it for next week. PROMISE!!! An excellent book so far. My mother and I are joint reading it so I only get a peek in when I get the chance. Part of the 1001 book list, I picked this up by chance. I have only taken a quick peek so I have no idea what it beholds yet. This was a library pick. I just liked the cover! And I’m a sucker for anything based in and around ancient Victorian London. It’s a mystery/ suspense novel written by a British actress. 1. ‘The Room’ by Hubert Selby Jr. I know I said it would be ‘Last Exit to Brooklyn’ last week, but after reading about ‘The Room’ I decided I would throw myself into the deepest, darkest, dankest of Selby’s novels to see if I survive the ordeal. It’s the kamikaze in me I suppose. There we are. My grand week in a single post. Hope everyone else has had a great one, and I look forward to your thoughts. Reading-wise things are finally beginning to pick up a bit. I’m spending far too much time on the blog and real-life seems to be a pain in the backside. There’s been a couple of inteesting reads and a nice little discount discovery I made the Stephen King’s ‘Under The Dome’ – only half price at WHSmith’s which is far better than the full £8.99. I recommend that UK book bloggers check it out as it’s supposed to be quite a cool read. My goodreads friends have recommended it to me. I’m also waiting on news from the arrival of ‘Last Exit To Brooklyn’ by Hubert Selby Jr., an author I’ve been dying to read ever since I heard about him. A very short collection of poems that were written during the last 9 months of Plath’s life. As you can imagine, not a happy read, but it certianly satisfied my need to exercise that part of the brain that deals with poetry. It took a while to get into her mindframe, but when I did it totally blew me away. Click here for review. Although the cover looks good (very inviting for a music lover like myself), I found this collection of five loosely interwoven stories a little lacking. I felt there was something missing. Maybe the short story isn’t for Ishiguro, he should stick to novels. Having said that, a concept like this would be wonderful to read from Haruki Murakami who also uses Jazz music as an element in his story-telling. Currently on page 110 of this fictional account of Thompson’s journalistic experiences during his short stay in Puerto Rico in the late 1950’s. It was written before Fear and Loathing, and retains the linear writing style of your average reporter. But I’m glad to say I can spot flecks of the pioneering Gonzo style very now and then. I’m halfway through this incredible read. It’s so engrossing that I stayed up till 2am reading till my eyes felt sore. I’ve never read anything as detailed as this about African tribes. Okonkwo is a very powerful character, and the tribe members are all very distinct from each other. The sense of community is very strong in Achebe’s story. Reading his work is like touching warm, fertile soil for the first time. Thanks to the Achebe, I haven’t had a chance to give this one much attention. But it will be finished today, so I’ll have lots to write about next week. 1.‘Last Exit To Brooklyn’ by Hubert Selby Jr. I heard about Selby Jr. through the movie ‘Requiem For A Dream’. I didn’t know it was originally a novel by Selby, and after some research about him I was surprised that not much is know about this unique author. His ad hoc writing style and gritty, dark subject matters make Chuck Palahnuik look like a writer for YA. I quickly decided that Selby Jr. was the real deal, and I would not rest until I’ve read something by him. And for something completely different! I’ve gotten tired of the ‘heavy’ books lately. I feel like a soldier with combat stress! This is on the Rory Gilmore Reading List, and surprisingly I’ve never read it before. Something warm and fuzzy for the child in me. That’s this weeks round-up fellow book bloggers. I hope you all have a great reading week and if you have any suggestions for good reads I’d be glad to know your thoughts! I’m off to make the rounds!